Believe it or not, I had never heard of Falcon Pro 3 until I read an Android Central article about top Twitter apps (Falcon was NOT mentioned) and the comments section was lit up with Falcon testimonials. I downloaded it from Google Play and now I understand the hype (statistics don’t lie – reviews and testimonials are the real deal!). 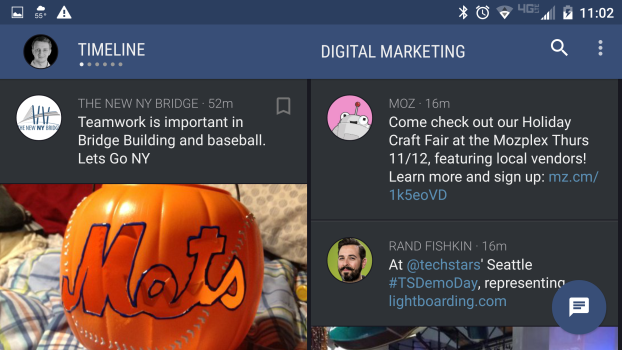 Much like other third party Twitter apps, Falcon lets you set up different streams of your choosing from lists and hashtags. What really sets it apart however, is how it displays rich media. 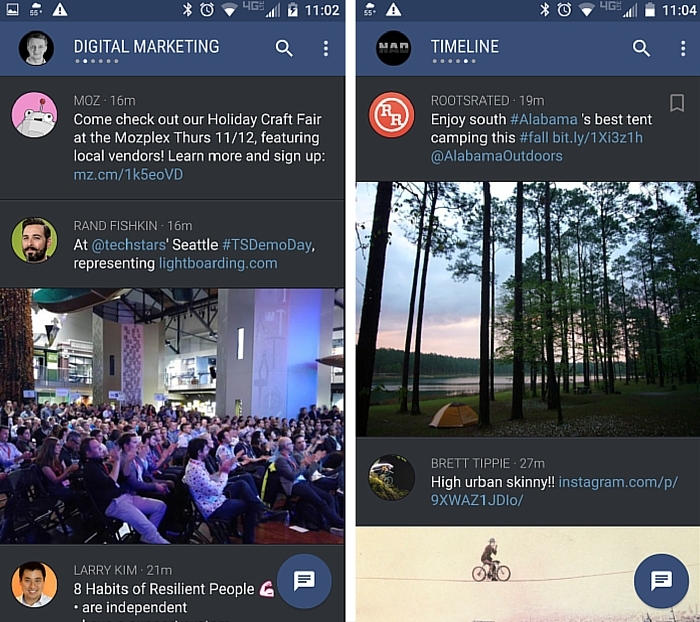 Images appear immediately in the newsfeed and take advantage of the full width of the screen (yes, even Instagram images, surely to Twitter’s dismay). This setting can be disabled, but really, why would you want to? 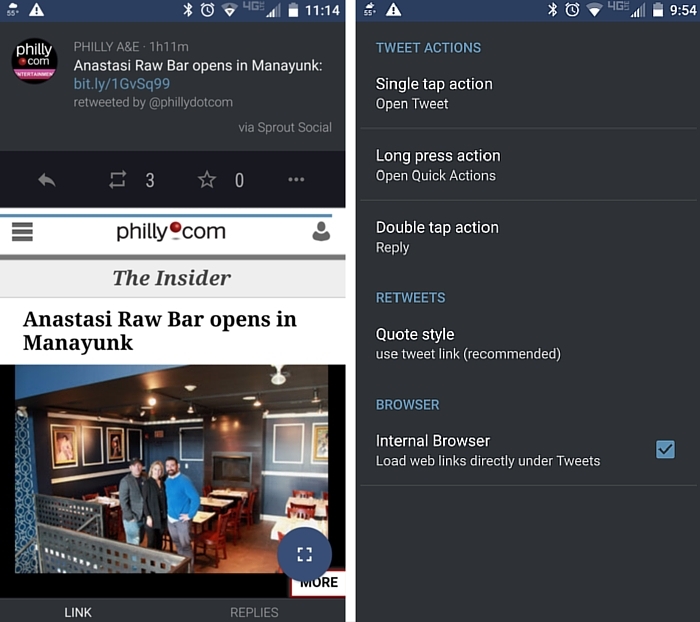 Even more impressive: By looking at a single tweet, Falcon will load the linked page within the app, meaning you don’t need to switch over to your web browser to look at it. Highly beneficial for those like myself who like to read an article and then come back, or for quickly previewing linked content before retweeting it. Hootsuite has a built-in web browser too, but you have to click on the link to open it within the app and in my opinion it’s clunkier. Note that if you don’t like this feature, you can disable it in the “Global Settings > User Experience” tab. Now make sure you’re sitting down for this next part, because I find it pretty incredible. Ready for this? Turn your phone in the landscape orientation. Bam! Now you can monitor two streams simultaneously. Something we’ve all become accustomed to with desktop utilities, but not available in app-form. Is it gimmicky? Maybe a little bit, but I’ve actually used it and I think it’s pretty cool. Forget Burger King, Falcon TRULY lets you have it your way. 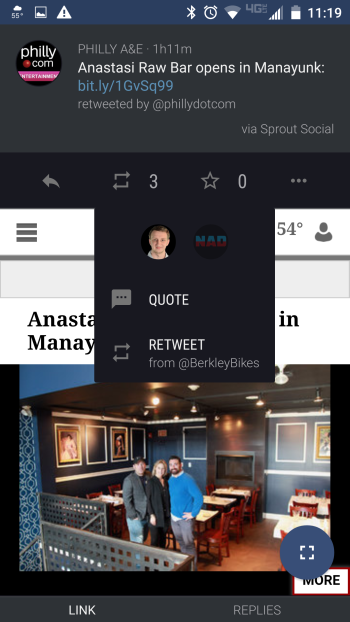 Three different actions – single tap, double tap and long press – can be paired with a corresponding action of your choice (view, favorite, retweet, etc.) You can also format the way that manual retweets appear. These days the default setting includes a link to the quoted tweet, but you can still rock it old-school with the “RT” if you want to. With more than one account, your stream count is going to start adding up and fortunately Falcon lets you re-order streams and also jump quickly from one to another. Swipe left from the right side of the screen and you’ll see a quick access menu. Press and hold one of the streams and you can move it into whatever order you’d like. A single tap will automatically take you to that stream. 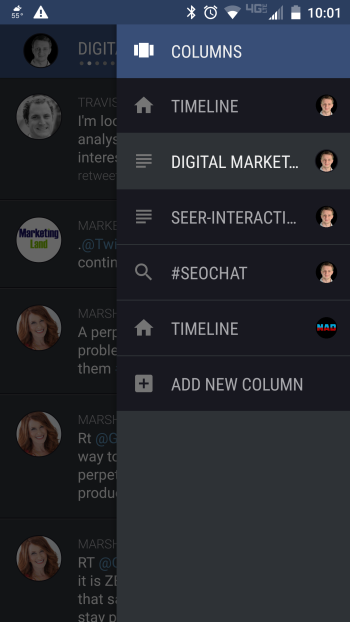 Adding to Falcon’s cool factor is that you can interact with any tweet, in any stream, from any account. This is really handy if you manage accounts in similar verticals or with intersecting groups of followers. Example: You set up a column for Account A and see a tweet that you really want to share from Account B. Tap the retweet button and it allows you to choose with account to use. You can actually send the same reply from multiple accounts simultaneously. I don’t know why you’d want to do this – in fact I’d prefer the ability to retweet & favorite from multiple accounts at the same time – but it’s possible. Falcon is entirely pay-to-play, but it’s worth it. The first account is $3.99 (one-time cost) and each account after that is $1.99. In other words, you can add four accounts for less than the cost of a trip to Starbucks. The search function is serious weak sauce. I tried searching for exact usernames that I follow, and they did not come up in search results. Seeing as my profession largely revolves around search – I found this particularly disappointing. I’ve settled on Falcon Pro 3 as my go-to Twitter app and I would wholeheartedly recommend it as a replacement for the native Twitter app, with cool features that are super useful for those who manage multiple accounts, or Twitter power users in general.